Smoke alarms are an important part of a home fire escape plan. When there is a fire, smoke spreads fast. People have a misconception that the smell of smoke will wake you up if you are sleeping. Working smoke alarms give you early warning so you can get outside quickly. AND DON’T FORGET……All smoke alarms should be tested at least once a month using the test button and make sure when you change your clocks for Daylight Savings, change the batteries in your smoke detector. An IONIZATION smoke alarm is generally more responsive to flaming fires and a PHOTOELECTRIC smoke alarm is generally more responsive to smoldering fires. For the best protection, both types of alarms or combination ionization and photoelectric alarms (also known as dual sensor alarms) are recommended. Smoke alarms should be INSTALLED away from the kitchen to prevent false alarms. Generally, they should be at least 10 feet (3 meters) from a cooking appliance. REPLACE all smoke alarms when they are 10 year sold. Roughly two thirds of home fire deaths happen in homes with no smoke alarms or no working smoke alarms. 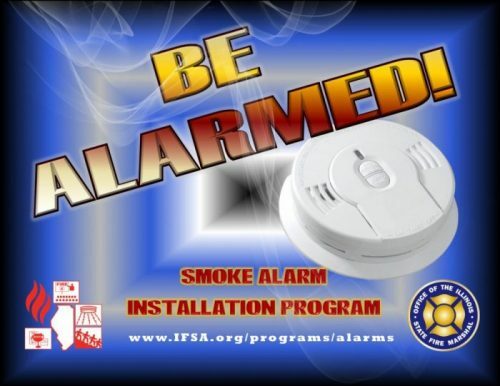 The Addison Fire Protection District is proud to provide and install smoke detectors (free of charge) to the residents we serve through the BE ALARMED smoke alarm installation program. The BE ALAMED smoke detector installation program is a collaborative effort between the Addison FPD, the Illinois State Fire Marshal and the Illinois Fire Safety Alliance. 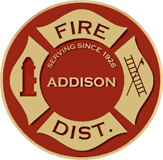 Contact the Addison Fire Protection District for more information at (630) 628-3100 weekdays between 8:00 am and 4:30 pm or email admin@addisonfire.org anytime you can also Click Here to learn more about this program.